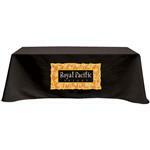 The 6’ 4-sided Table Cover drapes the top and all 4 sides of a standard six foot table. 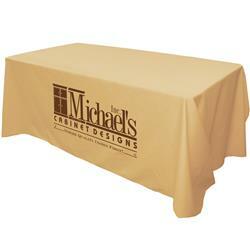 This table cloth is made with a 65/35 blend of poly/cotton twill and is cut with rounded corners for a more upscale look. 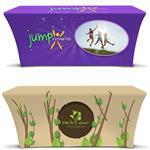 Choose from a variety of colors and customize with your logo for your next trade show! Standard 5 to 7 business days with paper proof. RUSH AVAILABLE PLEASE INQUIRE. 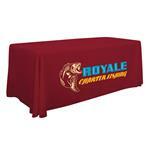 Differences may occur in fabric weight, fabric finish, color and overall size of the finished product. These variations are considered acceptable.